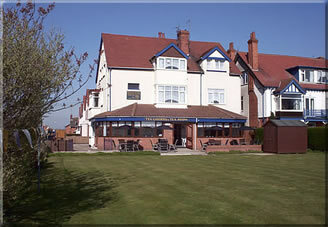 Beachlands Holiday Flats overlook the sea at the north end of the Skegness promenade. Local amenities such as shops (butchers, bakers, post office, newsagent & fish & chip shop), the sea and a bingo hall are all within 200 yards. Skegness town centre is approximately ¾ mile away and buses pass regularly for Skegness and Ingoldmells etc. Well behaved pets are welcome at no extra charge. All the holiday flats are fully self-contained and well equipped with fridge, colour TV, microwave together with duvets and pillows. Holiday flats A, C, D, F & G are equipped with a large fridge/freezer. Bed linen can be hired for just £5 per bed and packs of towels are available £3 per pack, especially useful for those travelling by public transport. Cots & high chairs are also available for hire if required, please ask when booking. Each holiday flat uses a coin meter for electricity (£1 coins), gas is included in the price of the flat (where applicable). A payphone is available on the first floor for visitors use together with a selection of books, jigsaws & beach equipment. The ground floor holiday flats have wheelchair access but are not suitable for wheelchair dependant visitors.